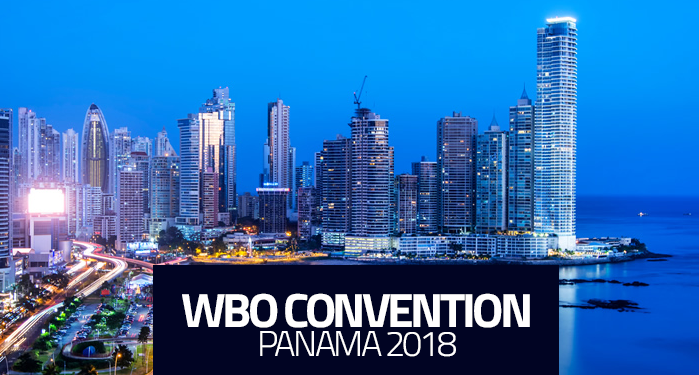 PANAMA CITY, Panama — The 31st WBO Convention in Panama could not be imagined without a thrilling boxing event, and that is precisely what boxing fans and convention attendees will get on October 31 at the plush Centro de Convenciones Vasco Núñez de Balboa in Hotel El Panamá in Ciudad de Panamá. The exciting main event is the intriguing battle between unbeaten, promising, young featherweights, Jean Carlos “Chapito” Rivera (15-0, 10 KO’s) of Puerto Rico, and Jason “El Alacrancito” Sánchez (12-0, 6 KO’s) of New México for the vacant WBO World Youth Featherweight crown. Also, in a battle of experienced world-ranked warriors, José “Páncora” Velásquez (21-6-2, 14 KO’s) of Quellón, Chile, faces tough Yenifel Vicente (33-3-2, 25 KO’s) of the Dominican Republic for the WBO Latino Super Bantamweight belt. Moreover, unbeaten Argentina fighter “El Avión” Agustín Gauto (9-0, 5 KO’s) climbs up to the square ring to take on skilled world-ranked Nicaraguan former world-title challenger Carlos “Chocorroncito” Buitrago (30-4-1, 17 KO’s) for the vacant WBO Latino 108-pound strap. In addition, unbeaten world-rated 2-time Olympian Jeyvier Cintrón (8- 0, 4 KO’s) of Bayamón, Puerto Rico, defends his WBO Latino 115-pound title against veteran Ricardo “El Matemático” Nuñez 29-8, 23 KO’s of La Chorrera, Panama, in a 10-rounder battle that promises fireworks. Furthermore, world-ranked WBO Latino Super Featherweight champion Francisco Fonseca (22-1-1, 16 KO’s) of San Ramón, Costa Rica, makes the second defense of his Latino belt against heavy-handed challenger Yohan Vásquez (21-2, 18 KO’s) of the Dominican Republic. Undefeated Jaime Valdespino (3-0, 2 KO’s) of Curundú takes on Eliécer Tenorio (2-2, 1 KO) of La 24 de Diciembre; plus, Edgardo Avila (1 -1, 1 KO) of Ciudad de Panamá squares off hard-hitting José Beitia (3-1-1, 3 KO’s) of David, Chiriquí. Winners will fight each other in the co-main event of next fight card “Box Zona 4” in Panama.